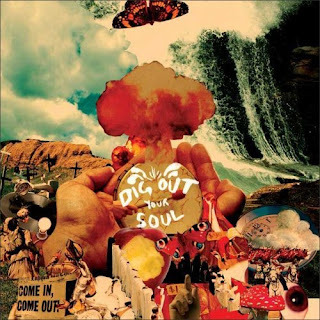 Although NOT an Off the Radar band, I've been digging Oasis latest record 'Dig Out Your Soul'. I didn't hear it when it first came out in October, but then I saw it on a few Best of '08' Lists & Nominated for Best Album on NME, so I went back to check it out. Used to be a big fan back in the Definitely Maybe/What's the Story, Morning Glory/Brit-Pop days, but kinda stopped listening to them after that. Didn't like what they were putting out. Not that it was that bad, but it wasn't that memorable either. After listening to 'Dig' I can safely say they are back and sounding better than they have in a long time. The record feels fresh and you can tell they pushed their boundaries and tried a few new things/sounds. Maybe their producer pushed them out of their comfort zone? The result, probably their best record since 'What's the Story, Morning Glory'. In particular I've been loving 'I'm Outta Time' with those classic sounding TV soundbytes towards the end. The way The Smiths/Morrissey used to do it. Here's that plus the great video for it, and another favorite 'Falling Down'. If you dig these I recommend you pick up the whole album, especially if you used to be a fan like me. It will remind you why you loved them in the first place. Great post Ray!! I also think this is one of their best albums. Kudos for posting this! Well said and done. MAYBE they will shock at the NME awards where they have numerous nods for best British band, video, live band (seen them twice), best album, although I think Radiohead might take that or even White Lies. They also got a nod for worst band, one award that one of the sometimes rivalry siblings might take is best dressed for Noel! They have to give at least that one!